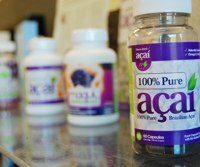 The powerful weight loss benefits of raspberry ketone are well known, and the ingredient has become an increasingly common sight on the labels of weight loss formulation ever since the US TV personality, Dr. Oz, stood in front of a camera and referred to raspberry ketone as ‘a miracle in a bottle’. The Protein Lab (based in the UK) are just one of many supplement manufactures who have jumped on the raspberry ketone bandwagon and produced a dedicated raspberry ketone blend. For reason or reasons unknown The Protein Lab seems to consider the blend is better suited for women, so they have placed the capsules in some nice pink and white bottles and are marketing it as part of their Skinny Diva range of products. Breaking it down a little they explain that weight loss will be achieved because the capsules will help the user to ‘burn fat at a higher rate’. Raspberry ketone has the power to do all of this, but some blends fail to fully utilize the power of the ingredient so it does not necessarily follow that all raspberry ketone products will live up to their manufacturer’s claims. 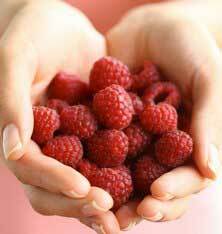 What is Raspberry Ketone and what Benefits can it Provide? Raspberry ketone is a compound that is found in several fruits, including cranberries and blackberries, but the ingredient is usually sourced from raspberries. Initial interest in raspberry ketone’s potential as a weight loss aid stems from laboratory tests conducted in 1995. Mice were fed unhealthy amounts of fat each day, while also being given regular doses of raspberry ketone, which appeared to prevent them from becoming obese. Despite the promising results, raspberry ketone remained a relatively unknown ingredient until Dr. Oz’ heard of the tests and decided to spread the word. Although raspberry ketone is known to be an effective weight loss aid, scientists are still not sure how the results are achieved. It has been speculated the ingredients may alter lipid metabolism by stimulating white fat cells in a similar way to the capsaicin component found in red peppers. Other tests indicate raspberry ketone can enhance the metabolism and fire up thermogenic fat burning. The ingredient is also believed to suppress the appetite, but most experts agree further study is required. 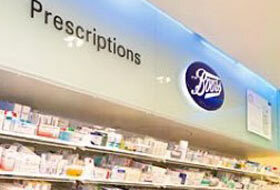 Cost can be often become a factor with raspberry ketone products. Natural raspberry ketone is an expensive ingredient to produce so some manufacturers opt to use cheaper, synthetic forms of the ingredient instead. Such versions invariably lack the power of the true ingredient and their existence can make choosing an effective raspberry ketone supplement rather tricky because manufacturers rarely state which form of the ingredient they are using. Each capsule weighs 450mg and contains 100mg of raspberry ketone. Which type of raspberry ketone is not specified. 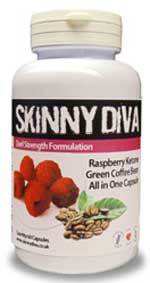 Skinny Diva states one or two capsules should be taken each day, with meals. That would provide a maximum daily dose of 200mg. Many experts agree that 100mg to 300mg of raspberry ketone is the correct daily dosage required for optimum weight loss, so the dosage here is about right. No customer feedback could be found. Skinny Diva Raspberry Ketone capsules are marketed on the premise that they can suppress the appetite and encourage fat burning. In theory the capsules should do just that. They contain a powerful ingredient and the inclusion rate is more than sufficient to produce the promised result—if the blend uses naturally sourced raspberry ketone. The fact that Skinny Diva fails to state which form of the ingredient they are using would not be an issue if customer feedback was available to provide an indication of how well the product worked for past customers. Some weight loss results are still probable. How good those results are likely to be is harder to say. In the end it’s a bit of a gamble, so consumers may wish to consider looking at alternative raspberry ketone products that are endorsed by the recommendations of past customers. 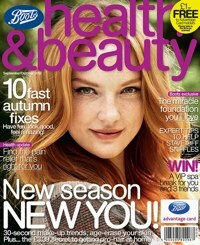 Sales of Skinny Diva products appear to be restricted to the Skinny Diva website, where customers can opt to pay £24.99 for a bottle of 60 Raspberry Ketone capsules or splash out an extra £5 for a bottle of 90 capsules. The 90 capsule option is easily the better deal, but customers should be aware Skinny Diva does not offer a money back guarantee. Postage and handling charges of £3.99 are applied to orders placed by customers in the UK, and non-UK customers can expect to pay charges of £8.99, but charges are waived on all orders that total £50 or more. Although raspberry ketone as an ingredient is highly recommended it has been somewhat surpassed by the later introductions – particularly the multi action diet pill. 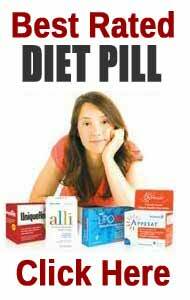 The best example of multi action, multi benefit diet pills is PhenQ. 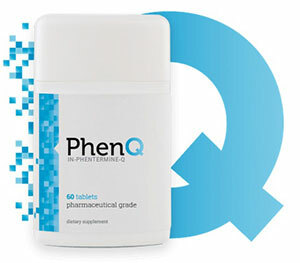 PhenQ is a combination fat burner, fat blocker and appetite suppressant – it also has fatigue fighting and anti oxidant ingredients. PhenQ is also covered by a 60 refund policy and ships without a delivery charge anywhere in the world. It’s manufacturers are so confident in their product that have made it absolutely 100% risk free in so much as if it does not live up to your expectation it would have not cost you a single penny, for this reason we rate PhenQ as our top choice.